SEMCOR can supply companies throughout the Midwest with a large assortment of fluid handling products known for their superior quality and low cost of ownership. Buyers choose SEMCOR because of our extensive in-house knowledge, inventory, service and fabrication capabilities. Whether you need a reliable product for everyday applications or a custom item to resolve your more challenging fluid handling issues, we can provide exactly what you are looking for. Metal expansion joints are used to prevent damage that may be caused by mechanical forces such as heavy vibration, pressure thrust and thermal growth. 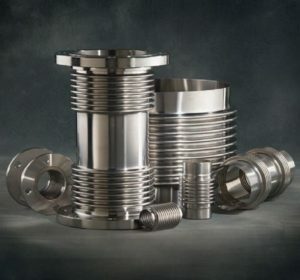 Normally installed in duct and piping systems, metal expansion joints consist of one or several metal bellows, connectors and tie rods. Metal expansion joints are used in many types of industries and applications including power generation, wastewater treatment, chemical processing, and pharmaceutical manufacturing. In keeping with our commitment to offering top-quality fluid handling products to our customers, SEMCOR provides metal expansion joints from Hose Master, one of the most respected manufacturers in the industry. We have established strong partnerships with Hose Master and all of our manufacturers to deliver the highest level of technical support to our customer base. If you are in need of custom metal expansion joints for a unique application, we can accommodate you. Our capabilities include complete fabrication and modification services. Our fabricated components are known for their remarkable performance and efficiency in the field. Learn more about our metal expansion joint offerings by reviewing the individual product descriptions or contacting us to receive additional product literature. You can also get in touch with our knowledgeable sales and service staff to discuss your specific metal expansion joint customization requirements.